Butch Cassidy was a famous American outlaw who served time in the Wyoming Territorial Prison in Laramie (1894-1896). Born in Utah in 1866, Cassidy’s real name was Robert LeRoy Parker. 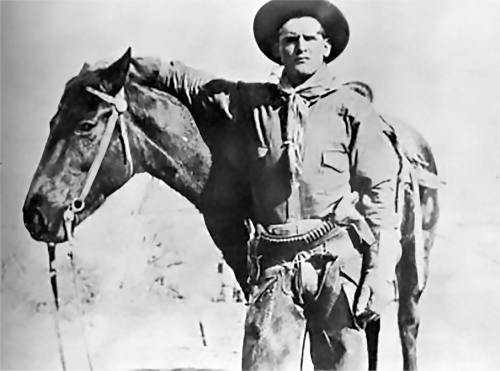 He was intermittently a cowboy or a cattle rustler, a bank robber or a train robber teaming up with a succession of other outlaws. His most notable partner — Harry Longabaugh – was known as the Sundance Kid. Together, they were members of the Wild Bunch. In 1901, when their capture by either sheriff posses or Pinkerton detectives was imminent, Cassidy and the Sundance Kid escaped to South America where they continued to rob banks, trains and mine stations. No one knows for sure what happened to them in the end. One story has Sundance killed by mounted soldiers in Bolivia while another has Cassidy returning to the United States and dying in obscurity. The 1969 Academy Award winning movie titled “Butch Cassidy and the Sundance Kid” starred Paul Newman and Robert Redford. Learn more about Robert LeRoy Parker — a.k.a Butch Cassidy.